I imagine it would be horrible to lose a limb in some sort of accident. One of my biggest fears is some kind of horrible industrial accident. Since I work around a bunch of printers and presses and with a bunch of awful machines, that’s always a distinct possibility. However, if that does happen, I hope my morbid sense of humor would lead to me getting my broken stump of a limb tattooed with something awesome, like these folks with unusual body tattoos. 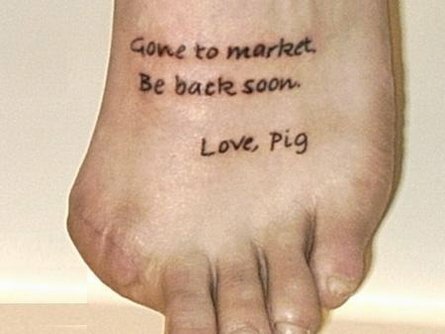 As I’ve always said, if you’re going to get a tattoo, you need to get something different than everyone else. There’s nothing more unusual than a shark tattoo on a missing arm stump! That’s a great way to turn something people are going to stare at to something that… well, people are going to stare at. But it turns a negative into a positive, right?